"Return to Eden Part 2", Jesse Wiedel, oil on canvas, 30" x 40"
Ah, the weekend has arrived. Even without sunshine, the yard work beckons, the garden calls. Or maybe a late morning lie-in with a novel and mug of coffee. Or an escape to somewhere warm and sunny, assuming such places exist. In any case, why bother with trekking hither and yon to explore North Coast Open Studios, Humboldt County's 12th annual tour de art? Last weekend, Shawn Gould would have been one answer to that question. The Eureka artist rarely shows locally -- he's better known for his work in National Geographic, Smithsonian and Audubon magazines. Stepping into his Fairfield Ave. home/studio, animals pose, soar, dive and otherwise inhabit every border. Humboldt-gray sunlight filters in through a wall of windows, lighting up the paintings leaning on the couch. A certain level of voyeurism is accepted in the Open Studios tour; seeing the private lives of the artists makes it even more appealing. For Gould, not only does Open Studios offer a chance to show off his work to a more Humboldt-centric crowd, but, he said, it also provides an impetus to "give the studio space a good cleaning." Another peek into the life of a working artist took place at Jesse Wiedel's studio. Attendance buoyed by the Facebook promise of "free beer" -- PBR and Heineken -- viewers gazed upon the consistently disturbing, sometimes disturbingly playful images chronicling civilization's decline. 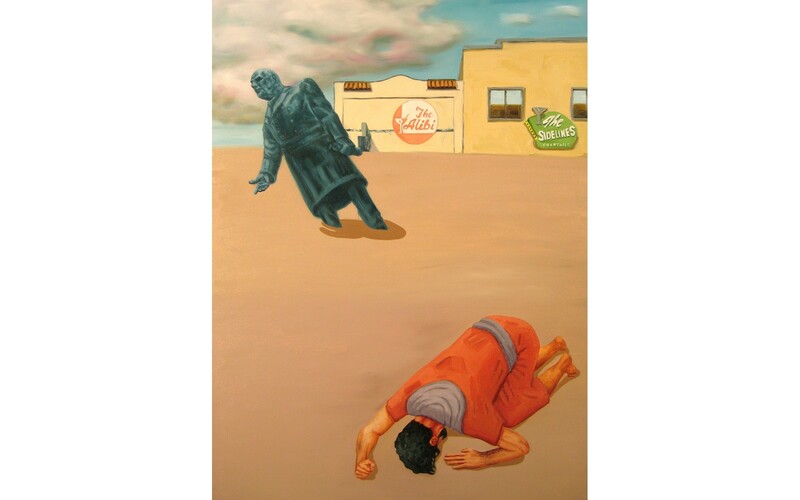 A newer piece references the ending of Planet of the Apes, only instead of Charleston Heston and the Statue of Liberty, Wiedel's painting portrays a worn down Humboldt local (one assumes) prostrating before the sinking statue of President McKinley. More relative lightheartedness was on display with a trio of bubbling bottles -- 40-ouncers in honor of Wiedel's 40th birthday, with the contents representing "bottled anxiety." While both Gould and Wiedel opted to participate in only a single weekend of Open Studios, many artists welcome guests both weekends. Among those, woodworker Zachary Shea, located at 3257 Old Arcata Road about a mile south of the Bayside Cutoff. While probably best known for his game tables and trestle seats, Shea also creates charming curio cabinets and paintings layered with rocks, branches, metal and sometimes plexiglass. "Sun Setting in Valley" and "Hazy Sun" are two examples of his soothing, appealing work. He's currently preparing for an October show at Arcata Artisans -- nudes, along with Natalie DiCostanzo and Joyce Jonté. (Joyce opens her space in StewArt Studios, 1125 16th St., Arcata this weekend.) Shea's wood-based take captures the same sensuality as Jonté's oft-displayed paintings, but brings in a whole different dimension. Given the amount of work filing his studio, one might think Shea whiles away his days creating art. He's a full-time carpenter, however -- he says he creates the time for following his passion by getting up "very early." The opportunity to appreciate the fine work of area artists in thier work spaces is combined with the option of purchasing that work at less-than-gallery prices. If Open Studios was a car lot, the commericial would sound something like, "Hello, Humboldt! For two weekends and two weekends only, we've cut out the middleman and cut our prices! It's the amazing direct-to-the-patron sale! Same great art for a lot less -- get yours now! Don't wait! This sale ends Sunday, June 13." The idea is, art lovers will take advantage of the variety of art available, appreciate the exhibition and support the artists by buying their work. This works out for both established artists and, with luck, newer ones. Participating in Open Studios is often a first step into the challenging navigation between art and marketing. New art collectors can find both amusing and useful tips at northcoastopenstudios.com: "Look around the studio. Are you in the right place?" Assuming you haven't stumbled into a neighbor's home, make sure to say hello. And, "When you see something you like, tell the artist. This will help create an opportunity for conversation." (I have a 1950s-themed guide on How to Be Popular that offers similar advice, so it must be true!) Remember, this isn't a yard sale. Don't try to haggle -- the prerogative of negotiation remains in the hands of the artist. Some especially practical advice: "Look around your house. Measure walls or spaces that you might like to decorate with artwork. Note any details about the space you are shopping for. Is it in direct sunlight? Is it directly above a screaming yellow sofa?" Another idea is using a digital camera to capture the space you're hoping to fill with art, then use the photo as a reference point when considering work you're interested in. If you're undecided, ask the artist if he or she minds you shooting the piece so you can study it when you get home. Likewise, note details about a studio or any artwork that particularly piques your curiosity. Very important: "You are not making a crucial life decision." Don't be afraid to take home something that speaks to you. This is not a test you're at risk of failing. But don't take more money than you can spend, either -- especially if you're new to shopping for art. You want what you purchase to make you happy, not trigger guilt or resentment when you gaze upon it. And don't feel like you have to buy something: "Open Studios is a great opportunity to learn more about art and to meet your artist neighbors. Go with a friend and talk about art you see. At the very least, you will have an interesting cultural experience." You can have your very own interesting cultural experience this weekend as North Coast Open Studios continues Saturday, June 12 and Sunday, June 13, 11 a.m. until 5 p.m. Visit northcoastopenstudios.com for complete listings or find the guide that was inserted in last week's North Coast Journal.